Price Improvement! Immaculately maintained home includes an in-law/guest suite w/kitchen & bath which is very private & perfect for your guests, parent(s), or other family members. In-law suite is perfectly located poolside with it's own entrance and is also well-suited for use as work from home office space. Every bedroom has it's own full bath; plus a half bath for guests. There is a saltwater pebble tec pool, solar heat & an outdoor shower. The rooms are generously sized. There are many recent upgrades including a tile roof in 2014, 2 A/C units, 2 water heaters, a re-screened pool cage, new pool tiles & decking. Located in the 24/7 security guarded & gated Heathrow community. Convenient to the Lake Mary Farmer 8217;s market, shopping, dining, entertainment. Easy access to I-4, SR-417, SR-429, and local attractions. There is also a Canoe launching area and fishing dock at Sawyer Lake Park located on the north end of the community. There are miles of paths & easy access to the Seminole Trail. Heathrow Country Club or Raquet Club membership is optional. Buyer(s) to verify room sizes. Property may be under audio/video surveillance. Enjoy the resort lifestyle in this phenomenal location for this charming showplace on a premium lot in the Tuscan style premier community of Devon Green at Heathrow Golf & Country Club. This luxurious two-story patio home is located on a quiet, tree lined street with majestic Oak trees. As you follow the brick pavered driveway you will be welcomed by classic red, lead glass doors. Upon entering the family room you will find 21 ft. ceilings parlayed with statuesque windows which illuminate the room! The family room has a cozy double sided wood burning fireplace surrounded by rich wood flooring. The chef of the family will enjoy cooking in this amazing, high tech kitchen with 42 chic, white cabinetry, refreshment bar, Pearl Granite Countertops & Iridescent Backsplash with Wolf cook top range and accompanied with high line appliance package. Follow the wood lined staircase to the master bedroom and drift off to sleep each night with the tranquil sounds of nature. Step into the intimate master bath with with gleaming white cabinetry and a sumptuous garden tub wrapped in decorative tiles bordered by a walk-in shower. The master bedroom has a private screened in balcony overlooking the well-manicured lawn. The second floor also features an additional master suite. Guests will enjoy the open air spacious lanai encompassed by brick pavers and colorful tropical plants. 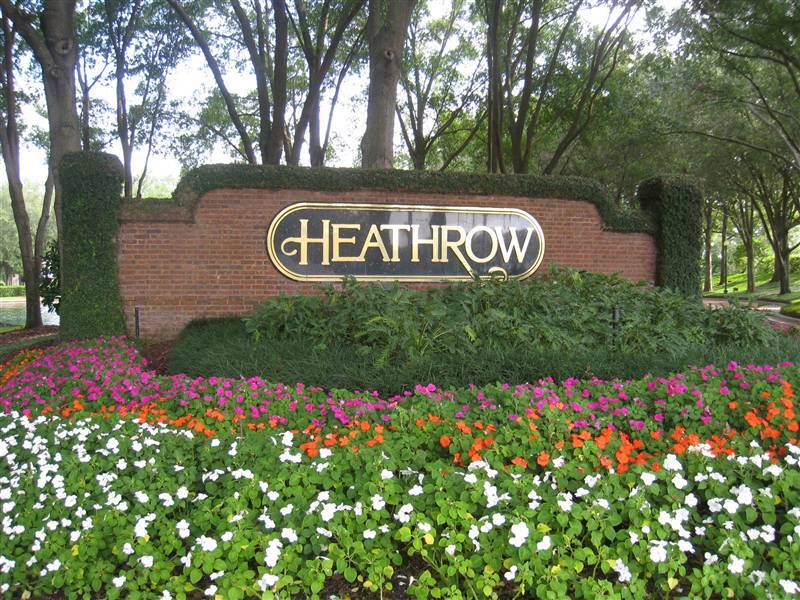 Heathrow features a resort style pool, Jacuzzi, fitness center, tennis courts, putting green, playground & park. This custom-built pool home has it all! Situated on a cul-de-sac in Heathrow 8217;s sought-after Regency Green, the circular driveway and oversized garage, complete with separate golf cart entrance, is only the beginning. A stunning double-door entry leads you into a spacious open great room with high tray ceilings, crown molding, and a fireplace with imported mantle. The kitchen is a chef 8217;s dream with granite countertops, cool-to-the-touch induction stovetop, double ovens, a second prep sink and a newer Bosch dishwasher. Enjoy guests at the breakfast bar while you entertain, or take it outside to the sunroom and onward to the screen-enclosed pool patio. This split plan home has spacious bedrooms with large closets and bonus space. Not to mention, a master suite fit for royalty with expansive closet space, a large bathroom with double vanities and even a private lanai! If all that isn 8217;t enough, this home also features a new AC system with 2 airflow filters and ductwork, newer pool pump, new patio screening and doors, new irrigation timer and fresh paint inside and out! Regency Green has convenient access to Markham Woods Road, Lake Mary Blvd., International Parkway, and the 417, making it a prime location. Set your appointment to see this gem today!